Being a Ford dealer in Chicago requires devotion, patience, and the ability to know all about Ford models. Here at Al Piemonte Ford in Melrose Park, all of our attention goes towards our customers on a daily basis. As a customer, your needs are put first, and our professional staff will ensure that your visit to our dealership is a good one. We serve the entire Chicagoland area, including the city of Chicago. Many residents living in and around Chicago need a reliable Ford dealer, and Al Piemonte Ford delivers in all areas. We have a vast lineup of new vehicles including different vehicle styles such as the Coupe, the Minivan, the Pickup, the Sedan, SUVs, Vans and much more! In addition to selling new vehicles, you can also check out our pre-owned inventory where you will find a wide showcase of vehicles from all sorts of wonderful car manufactures. These vehicles are priced lower because they are used, but that does not mean you are not receiving a quality, durable vehicle that will give you plenty of joy and satisfaction in the years to come. As an Al Piemonte Ford customer, you can schedule a test drive online and get into the vehicle you have wanted to drive at the day and time of your choice. 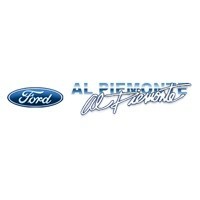 There is plenty of good reason why to choose Al Piemonte Ford. As an Illinois Ford dealer, Al Piemonte Ford has some pretty cool specials in store for you. Our specials will help you save money, and we even have Internet coupons and incentives to get the ball rolling in the right direction. Our professionals are here to assist you in every way possible. If you ever have a question about our service and parts, accessories, or our money saving service coupons, just feel free to ask one of our customer professionals, and he or she will take care of the rest. For financing, you can fill out a credit application online and calculate you trade. We also invite you to use our loan calculator online that allows you to calculate your monthly payments, and we even have a MPG calculator that gives you the advantage of figuring out how much money and gas you will save when you go and purchase a new Ford vehicle. If you ever need parts, you can order parts online or just come into our parts department, and one of our professionals behind the desk can assist you with all of your replacement part requirements. As you can see, a great Ford dealer serving Chicago not only knows all about Ford cars and trucks, but is one that is willing to reach out to its customers in order to help them save money and make life easier, when it comes to buying a car or truck. Al Piemonte Ford wants to take care of all our Chicago customers. As a Ford dealer serving Chicago, Al Piemonte Ford has deals for under $10,000 and vehicles that will give you over 30 MPG! Now that is a terrific deal! Our goal is to make you feel welcome and to lead you in the right direction. We will be more than happy to show you our new and used models while giving you a tour around our dealership. We offer honest, open service, and we work with creditable lenders to get you the best loan when financing. You can meet our team by simply clicking on the link or by just coming into the dealership. All of us here at Al Piemonte Ford want to welcome you to the family, and we anxiously look forward to meeting you and doing business with you at your next convenience.